Furniture Maven: Put an end to re-gifting now! American Leather and wasser's is declaring an end to re-gifting! 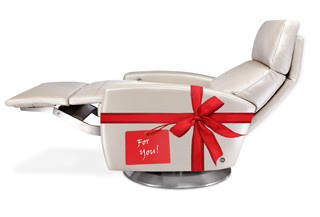 Through American Leather's top retailers like wasser's , you can purchase an American Leather gift card for a customizable Comfort Recliner™ for a lucky recipient (or yourself!). Find out more! Wasser's has lot's of available styles in stock in an assortment of sizes, colors, fabrics and leathers to make the perfect holiday gift for the one you love while guaranteeing delivery of in stock items just in time for the holidays! You can also special order any color fabric or leather of your choice for a custom 30-day delivery. Now, you can even get it faster with American Leather's Early Bird Option for delivery in your home in just 20 days! Call Jaime or Josh for more information @ 954.454.9500. 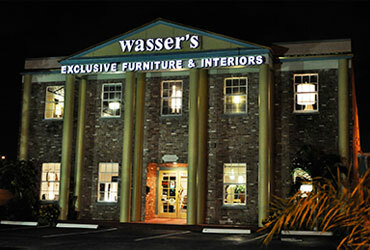 Come in and see our full selection in our American Leather Comfort Recliner Gallery at our Hallandale Showroom. The Comfort Recliner™ features the Infinity System, a personal, infinite-position system that adjusts to your exact comfort needs. Read below to discover why the Comfort Recliner is all your recliner wishes come true! In the quest for ultimate personalized comfort one size does not fit all. Every Comfort Recliner™ is available in the Infinity 3, Infinity 5, the Infinity 7 or the Infinity 9 to accommodate the differences in height, weight and personal preferences. Try all three sizes and pick the perfect chair for you. Shop the Comfort Recliner Gallery now!